What if you could act to improve air quality? Developed by IFP Energies nouvelles (IFPEN), with the support of ADEME, Geco air is available for free on the iOS and Android stores. Participate in the Geco air movement, reduce your impact to breathe cleaner air! Atmospheric pollution, CO2 emissions … Each of us, can reduce its own polluting emissions (nitrogen oxide, fine particles, etc.) related to his/her trips: by adapting his/her driving style (more smooth) and favoring “sustainables” modes of transport (cycling, public transport). Geco air is here to accompany us in this process. Recently air pollution hits the headlines. For now, debate is limited to the most polluting vehicle technologies such as gasoline fueled vehicles. Geco air adds the eco-citizen axis and define our mobility behavior at the heart of the action! – Recommending us to choose soft transportation modes such as cycling when possible. The benefits are real: by optimizing our driving style, emissions of our vehicle can be reduced by half! And even with an old vehicle, we can all act together to improve the quality of the air! The level of pollutant emissions (nitrogen oxide, fine particles, carbon monoxide) of a vehicle depends on its technology, the type of journey but also the driving style. This last point remains little known, however, for the same route and the same vehicle, polluting emissions can vary by a factor of 1 to 4! The application is available for free on the app stores. Test the application in demo mode, or set up your account in just a few clicks. Forget it then in your pocket; The application will analyze your trips in a completely automatic way. You only need to refer to your journal to see your results and receive tips to reduce your air quality impact. 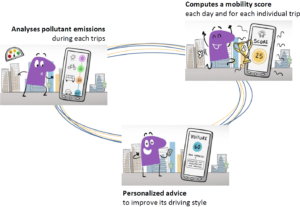 All pollutants are combined into a single, simple indicator, the mobility score. A mobility score is computed for each trip, taking into account local pollutant as well as green house gases and fuel consumption. By following his/her mobility score, the user will measure the polluting impact of each of his/her routes. For instance, taking a car for a short course will greatly decrease his/her mobility score of the day and encourage it, if it can, to choose wisely its transporation mode. At the end of each journey, the result is accompanied by simple and practical advice to improve the way of driving and thus contribute to improve air quality. In order to reduce battery consumption and respect your privacy, the GPS is activated only when necessary (only during your car trips). Geco air helps us to better understand air pollution at the local scale and thus helps to improve air quality estimate. Gecoair collects data on your trips And does not have commercial purpose. Funded by IFPEN, and Ademe, this initiative aims to fight against environmental degradation. The deployment of the application will collect significant data to feed our research. For example, we will be able to study pollution on a trip, on a particular route, through data from several drivers over several days. From there, we can release a map and point out areas of high particulate emissions and pollutants. These data can then be used to influence the structure of the road: to favor a 30km/h paved zone rather than a speed bump to avoid sudden drivers’ accelerations and thus a pollution peak … Simple ideas to start with but which could lead state departments, air quality agencies and municipalities to take action based on actual experience and real driving conditions based study. This is a citizen science campaign, enabling the citizen to participate in scientific projects that are based on real usage data. With Geco air, IFPEN uses its scientific expertise in the fields of pollutant modeling and engines, and the development of algorithms. Geco air complements the action initiated by IFPEN in 2014 in the field of services connected with the ecoconduite app Geco which already counts more than 26,000 users. To know more: How does it work?